เอ็มเอ็น เฮอร์สตัล ผลิตปืนกลแม็ก 58 ขนาด 7.62 มม.และปืนกลเอ็ม2 ขนาด 12.7 มม. เมอร์คาวา มาร์ค 1 และ 2 นั้นมีอาวุธเป็นปืนใหญ่เอ็ม68 ขนาด 105 มม. ในมาร์ค 3 นั้นเป็นดอร์ ดาเล็ท บาซ คาสแซค (Dor Dalet BAZ kassag) และของมาร์ค 4 เป็นปืนลำกล้องเกลี้ยง ขนาด 120 มม. 50 กม./ชม. 60 กม./ชม. 64 กม./ชม. ในเดือนมิถุนายน พ.ศ. 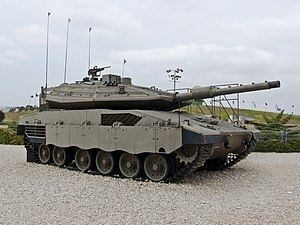 2557 อิสราเอลมีการเซ็นสัญญา a landmark contract with a foreign government for the sale of its locally- produced flagship Merkava IV main battle tank, local media reported on Sunday. ↑ 3.0 3.1 "The Institute for National Security Studies", chapter Israel, 2012 May 8, 2012. 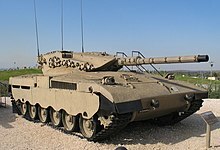 ↑ "Israeli Merkava tank production to stop within four years", Amnon Barzilai, Globes Online Retrieved September 26, 2007. ↑ Oren, Amir (2006-11-07). "IDF preparing for another conflict by next summer". Ha'aretz. สืบค้นเมื่อ 2007-09-29. ↑ 7.0 7.1 "Merkava series". War Online. สืบค้นเมื่อ 2008-07-04. ↑ "Merkava Mk3 Baz". Army Technology. สืบค้นเมื่อ 2008-07-04. ↑ "Merkava Mk 1". Israeli-Weapons. สืบค้นเมื่อ 2008-07-04. ↑ "Merkava Mk 2". Israeli-Weapons. สืบค้นเมื่อ 2008-07-04. ↑ "Merkava Mk 3". Israeli-Weapons. สืบค้นเมื่อ 2008-07-04. ↑ "Merkava Mk4 Detailed". Defense Update. ↑ "Israel investigates Gaza tank blast". BBC. 2002-02-15. สืบค้นเมื่อ 2011-09-17. ↑ "Victims of Palestinian Violence and Terrorism since September 2000". MFA. สืบค้นเมื่อ 2010-09-17. ↑ Marcus, Jonathan (2006-08-15). "Apparent vulnerability of Israeli armour to Hezbollah anti-tank rockets". BBC. สืบค้นเมื่อ 2010-03-27. ↑ Mohamed Nazzal (July 12, 2012). "Ali Saleh: Destroying the Merkava Myth". al-Akhbar. ↑ Blomfield, Adrian (2006-08-15). "Israel humbled by arms from Iran". London: The Daily Telegraph. สืบค้นเมื่อ 2010-04-23. ↑ "Kornet ATGMs captured in Ghandouriyeh" (JPEG). Center for Special Studies. 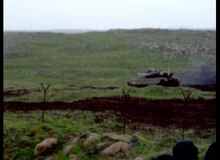 ↑ "Why did Armored Corps fail in Lebanon?". Ynet. ↑ Barzilai, Amnon (30 August 2006). "Defense establishment favors Rafael tank protection system". Globes Online. สืบค้นเมื่อ 11 September 2009. ↑ "God's chariot". Aljazeera. สืบค้นเมื่อ 2008-07-04. ↑ Marcus, Jonathan (2006-08-15). "Tough lessons for Israeli armour". BBC. สืบค้นเมื่อ 2008-07-04. ↑ "Assessing the performance of Merkava Tanks". Defense Update. ↑ "IDF mulls spending plan". Ynetnews. สืบค้นเมื่อ 2008-07-04. ↑ Yaakov Katz (August 31, 2007). "New training aims to help tanks cope in hostile territory". The Jerusalem Post. ↑ Katz, Yaakov (Aug 13, 2009), Security and Defense: 'The tank is one of the most technologically advanced platforms around, Jerusalem Post . ↑ Weiss, Efrat (2009-08-07). "IDF successfully tests new tank defense system". Ynetnews. สืบค้นเมื่อ 2009-08-07. ↑ Katz, Yaakov; Stoil, Rebecca Anna (12/21/2010 15:43), IDF predicts violence to subside despite Gaza pounding, The Jerusalem Post Check date values in: |date= (help). ↑ Harel, Amos (2011-03-01). 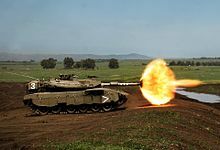 "IDF armor-defense system foils attack on tank for first time". Haaretz. ↑ "Turkey 'freezes arms deals with Israel'". upi.com. สืบค้นเมื่อ 1 June 2014. หน้านี้แก้ไขล่าสุดเมื่อวันที่ 7 มีนาคม 2558 เวลา 03:00 น.